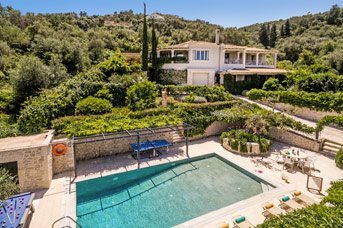 There is plenty to keep you occupied in and around the village if you can tear yourselves away from the private pool in your very own villa. Right outside your villa there are miles of gorgeous, unspoilt countryside to explore on foot or horseback. 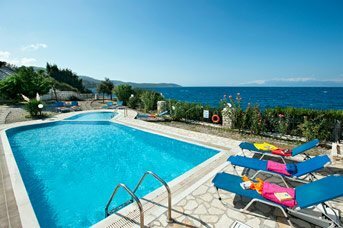 But if you fancy seeing more of the island on your holiday, Kassiopi makes a great base. Acharavi, the main town in this area is nearby along the picturesque coastal road and worth visiting for its splendid 2 mile crescent of clean sandy beach, with warm shallow water perfect for playing and paddling. 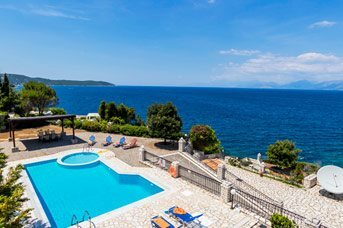 You will be able to buy most things you need while on your holiday in Kassiopi. It has many shops including butchers and bakers – no candlestick makers, alas. It is good for local handicrafts such as gold and silver jewellery, things made from the local olive wood and very good soap made from olive oil. Locally made ceramics, lace and embroidered linen are high quality, inexpensive and widely available as well as leather belts, wallets and bags. You will have no problem finding English newspapers. Kassiopi has plenty of mini markets and 2 small supermarkets, one in the village square and one on the road out - great if you want to cook at your villa. The town has cash machines, travel agencies, a doctor or a pharmacy. 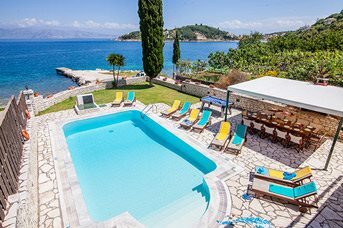 In Kassiopi, as in most places around Corfu, you will find that most shop assistants speak English. 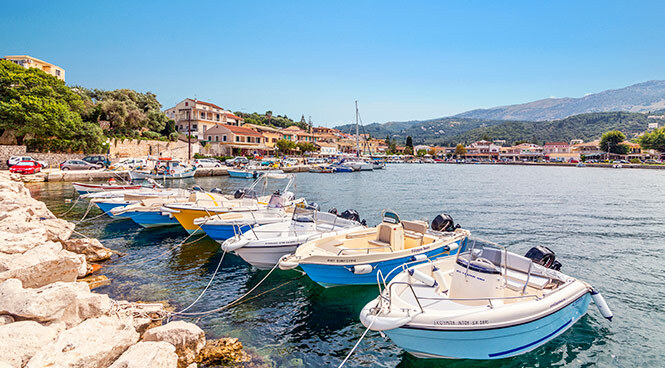 Kassiopi has a rich and diverse history going back 2000 years. It was once one of the most significant regions of the island, and an important port and centre for communications. It had its own workshop for making currency, and had some very grand visitors such as Neronas, king of Rome who built the baths of Kassiopi. Cicero, Ptolemy and Emperor Nero are also believed to have dropped by. The town was destroyed by the Venetians during the Roman Empire but in 1604 priests from Epirus established themselves in Kassiopi and restored its power. The most obvious hint of its previous significance is in the ruins of its once-imposing fortress. It was built by the Angevins who ruled Corfu in the 13th century until1386 when they were booted out by the Venetians who ruled for the next four hundred years. 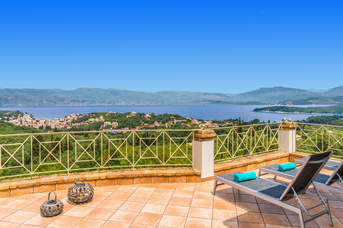 You may have chosen a Villa Plus villa in Kassiopi to relax and take it easy, but if you want a more lively holiday, there is plenty to do here apart from swimming, sunbathing, eating and shopping! Pony trekking and horse riding are a great way to explore the wonderful countryside on trails where cars cannot go. Perhaps you are fit enough to climb Mount Pantokrator for the amazing views from up there? If that sounds too energetic it is a wonderful area for civilised walking. Or if you head for the beach, local diving centres will help you learn the essentials of scuba diving, water skiing or paragliding if merely swimming is too tame for you. If you want to stay on dry land you could play tennis or golf or try mountain biking.